It was supposed to be a historic meeting to bring the two superpowers (yes Russia is back up there) back into better relations. How is it that Israel turned into the centerpiece of the discussion? US President Donald Trump said overnight Monday that he and Russian President Vladimir Putin had reached “a really good conclusion for Israel” during their summit in Helsinki, but did not elaborate on the details. “At the end of this meeting I think we really came to a lot of good conclusions, a really good conclusion for Israel, something very strong. He’s a believer in Israel, he’s a fan of Bibi,” Trump told Fox News about President Putin, using Prime Minister Benjamin Netanyahu’s nickname. “And (he’s) really helping him a lot and will help him a lot, which is good for all of us,” the president said. During a joint press conference after the two leaders’ one-on-one meeting, Trump said that the United States and Russia will work together to ensure Israel's security, adding that Netanyahu had been consulted on the matter. "We both spoke with Bibi and they would like to do certain things with Syria having to do with the safety of Israel," Trump told reporters. "Russia and the United States will work jointly (in this regard)." "Working with Israel is a great thing and creating safety for Israel is something both Putin and I would like to see very much," Trump said. Two wolves salivating over the lambchop. And Bibi Bunny doing what he does best. ...Our military sources note that only 20 percent of the Syrian army consists of Syrian troops; the other 80 percent are Hizballah and other Shiite militias loyal to Iran. Today’s Syrian and allied victory therefore brings these hostile forces to within 3-4 km from Israel’s Golan border. The Erev Rav regime and its ill-fated military wing are headed for a very hard fall. Hashem yerachem aleynu! Be ready to pick up the pieces. With IDF poised to strike Hamas, is Israel’s Northern Front forgotten? To the anonymous who wrote that "Arab land" was "stolen": you can't steal what belongs to you. Rav Elchonon Wassermann writes in מאמר עקבתא דמשיחא that the less the אומות העולם talk about us, the better it is for us. 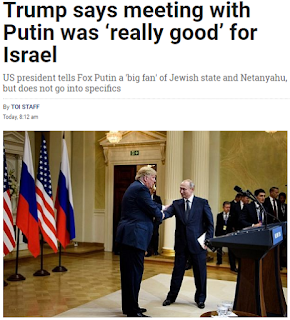 If two world powers (Putin & Trump) talk about Israel , it is a very bad thing for us. And the Americans think THEY have been sold out! DEBKAfile has obtained exclusive access to this deal and can reveal for the first time that it provides for the handover to Russian responsibility of all parts of southern and southwestern Syria abutting on the Israeli and Jordanian borders, including, most importantly, surveillance and observation elevations that oversee all parts of Syria, Iraq, Jordan, Israel, Lebanon and the eastern Mediterranean.